Breakfast is unfortunately is the most overlooked meal of the day. The problem for me is 1. I L-O-V-E breakfast foods and 2. I’m like everyone else and I have no time to make myself something worthy of being considered breakfast. I’m sorry, but a bowl of sugary cold cereal at 7am just hits my stomach like a rock, and swinging into the DD on my way to the office most always makes me late. Through my experimentation with different ways of eating, I’ve noticed that a high-protein breakfast not only keeps me going through lunchtime, but it’s pretty effective at helping me keep my weight in check. Also as a skater, my body needs all the protein it can get. 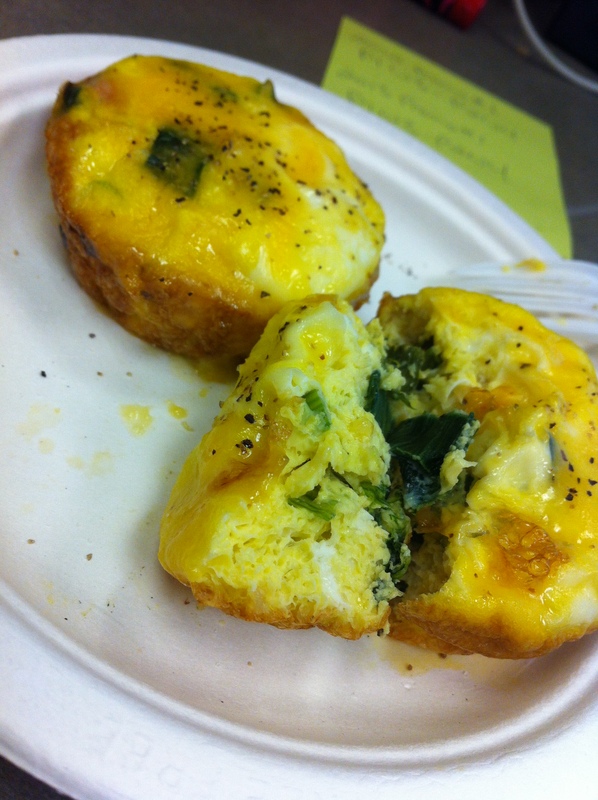 While looking through some clean eating sites, I came across something called an ‘egg cup’. Basically they are mini egg quiches but without the crust, and by far the best thing that I’ve incorporated into my morning routine since the snooze button. 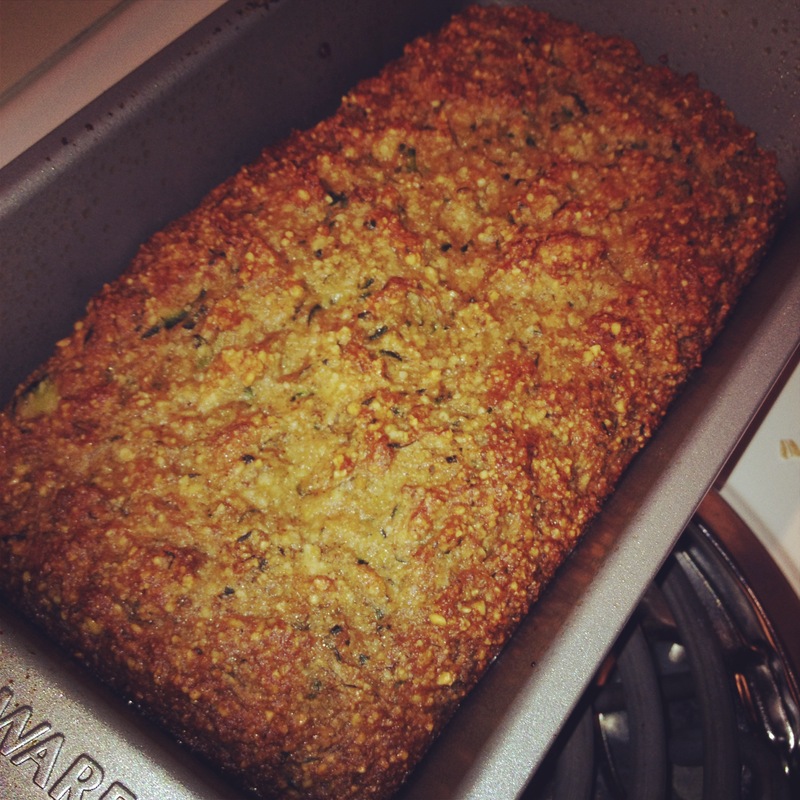 Do these Sunday while you’re making dinner, and you’ll be ready to go in the morning! Cut the rough top of the leak off and discard, about 1” from the end. Thinly slice the leak all the way to the bottom. Rinse under warm water thoroughly to remove any sand (leaks are notoriously sandy). 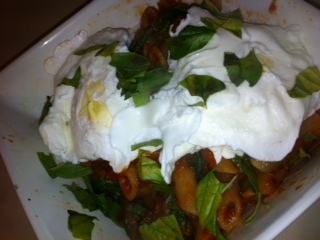 Sautee the leaks in a pan in your favorite fat or cooking spray of choice on medium heat until they are soft. Mince the bacon and add to the leaks. 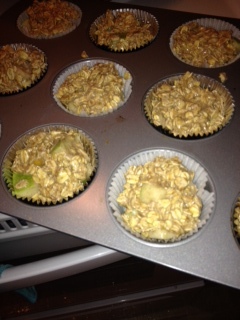 Spoon the leak and bacon mixture into the muffin tin. Resist the urge to season the ingredients! Adding salt to eggs while they are cooking can make them tough, and the bacon you are using may have enough sodium already. Do feel free to use herbs, like rosemary, or pepper. Crack your eggs into a bowl and whisk together. 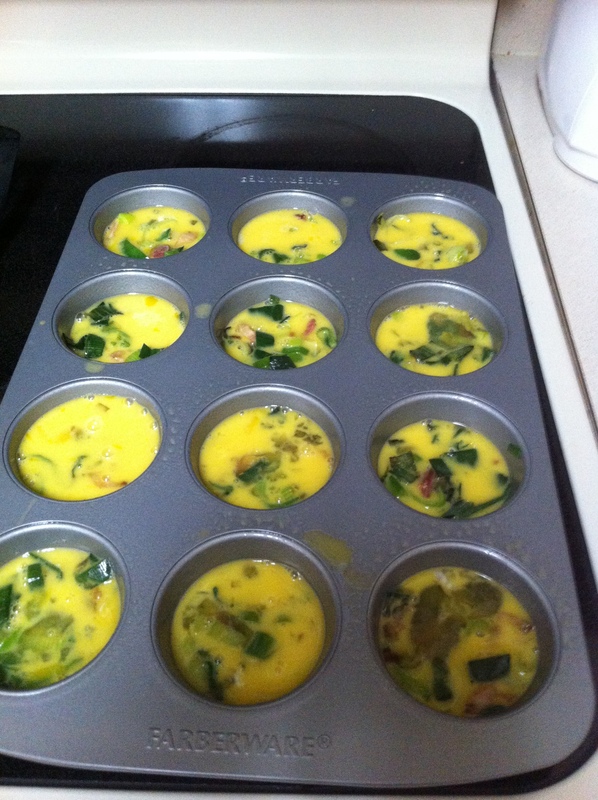 Pour enough egg into the muffin tins to reach about 1/2 to 2/3 of the way up the side. They will puff up! Bake for 10-15 minutes, or until they have risen and look firm on top. Remove and sprinkle a pinch or two of shredded cheese on top. 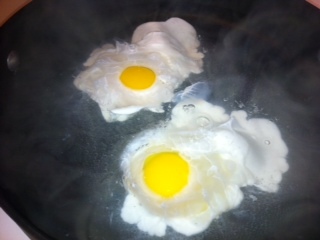 The heat from the eggs will melt it while they rest. 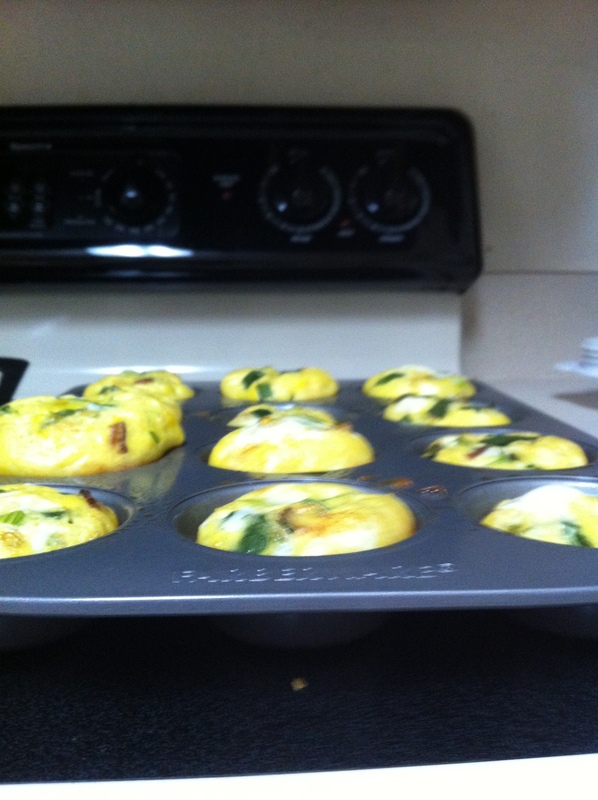 While they are still warm (but not hot), gently lift the egg cups out with a fork and place into a container. To reheat in the morning, pop them into the microwave for 30-50 seconds and you have a delicious way to power up in the morning! There are a million ways you can tweak this recipe. It lends itself as a way to use up any leftovers you might have, like the veggies that you didn’t finish at dinner mixed with some extra sausage you made for breakfast over the weekend. Try any combination of grilled or sautéed vegetables, but make sure that your ingredients do not contain much water. If you’re using spinach, be sure it’s relatively dry before you add it to your muffin pan- spinach and mushrooms hold a lot of water, which will compromise the texture of your eggs. I’m a fan of zucchini, asparagus, and onions. Play around with different cheese to top your egg cups with. I think hard or semi-soft cheeses would work best. Sharp cheddar and parmesan are my two favorites, especially because they add a lot of flavor without having to use much.